An arch style door features a rounded arch at the top of the door panel, which may be either raised or recessed. Compare with a square style. A square style door features a straight perimeter frame around the center panel, which may be either raised or recessed. Compare with an arch style. A slab style door is a flat door without a raised or recessed panel. A recessed panel door has a flat panel recessed inside the perimeter of a door. Compare to a raised panel door. A raised panel door features a more decorative center panel that rises in the center. Compare to a recessed panel door. A full overlay door means there is very little cabinet frame showing around each door and drawer front, creating a living space with a modern, seamless appearance. Cabinetry designed with a 1/2" overlay door and drawer front leaves 2" of the cabinet frame exposed between the doors, creating a more traditional look. Burnished finishes create a warm, traditional look, resulting in unique, fine-furniture detailing on cabinetry. This multi-step process includes an artistic over-sanding technique to create the aged look of fine furniture, randomly applied worm holes and compression marks to add additional distressing, and a dark burnishing stain artistically applied to all raised or profiled portions of doors and drawer fronts. The burnishing stain is followed by a base color stain, which is then hand-wiped to reveal the inherent beauty and natural characteristics of the wood. As a final step, our oven-cured DuraKraft topcoat is applied to provide a beautiful and durable furniture finish. Because this process features several different techniques, the detail and look will vary from piece to piece. Suede topcoat is a softened sheen that provides the same resistance to scuffs, dents, moisture, UV fade and household chemicals as our standard topcoat. The suede topcoat is standard on distressed finishes, and available on certain other finishes. Talk to your kitchen designer about the best finishes and finish techniques to get the look you love. The distressed technique replicates the look of reclaimed wood. Using proprietary techniques, our skilled artisans carefully hand-distress and detail every door so each one is unique. A dark burnishing stain is carefully brushed onto corners and select raised areas. After the stain is hand-rubbed into the wood, a durable matte suede topcoat is used to complete the distressed look. Highlighted finishes feature a standard stain that is "highlighted" with hand-applied glaze color in the recessed areas of doors and drawer fronts. This unique process does not alter the base color of the door, yet adds an additional highlight color to enhance the profiles and recesses of the door design. As a final step, our oven-cured DuraKraft topcoat is applied to provide a beautiful and durable furniture finish. Glazed finishes add richness and warmth to wood surfaces. The base stain or paint finish is applied followed by the application of a glaze finish to the entire door or drawer front. 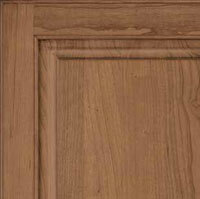 The glaze is then hand-wiped to create a soft, light "hang up" in profiles and recesses of the wood. Each door design, wood species and glaze finish has its own charming character and will create a unique, one-of-a-kind look. As a final step, our oven-cured DuraKraft topcoat is applied to provide a beautiful and durable furniture finish. Painted finishes feature rich, beautiful color coating on wood, adding rich depth to your selected profile. Paint is applied using a spray application process to EverCore™, Maple, or Oak. Stained finishes showcase the inherent natural beauty and characteristics of each individual wood species. The stain is applied and hand-rubbed to ensure full and equal color coverage. As a final step, our oven-cured DuraKraft topcoat is applied to provide a beautiful and durable furniture finish. Available in white or soft cream, Thermofoil cabinet doors feature a flawless, silky-smooth surface. Thermofoil material is applied to medium-density fiberboard (MDF) using an intense heat and pressure-bonding process to ensure durability. Thermofoil finish is made of laminate and provides a uniform look from door to door. Vintage finishes give the appearance of heirloom cabinetry that has been well-loved and used through the years. This multi-step process includes an artistic over-sanding technique to create the aged look of fine furniture, randomly applied worm holes and compression marks to add additional distressing, and the application of several coats of paint. The corners and edges of doors and drawers are over-sanded for a second time, revealing the beauty of natural wood. As a final step, our oven-cured DuraKraft topcoat is applied to provide a beautiful and durable furniture finish. Because this process features several different techniques, the detail and look will vary from piece to piece. Vintage Patina finishes give the appearance of heirloom cabinetry that has been well-loved and used through the years. This multi-step process includes the same steps as the Vintage Finish process followed by a hand-wiped penetrating glaze that adds richness and creates a soft "hang up" in profiles and recesses of the door and drawers. As a final step, our oven-cured DuraKraft topcoat is applied to provide a beautiful and durable furniture finish. Because this process features several different techniques, the detail and look will vary from piece to piece. Our Aged technique evokes the look of artisan-finished cabinetry that has been well loved over time. Distressing effects are hand applied artisan methods that are random and inconsistent in appearance. Because every detail is hand applied, each finished component will have a unique appearance. The effects include edge rasping, worm holes, edge burnishing, softened corners and edges, random dent patterns and a suede topcoat. Natural Birch is a medium density hardwood with a fine, moderate grain pattern that ranges from straight to wavy or curly. The predominant sapwood color is white to creamy yellow, while the heartwood varies in color from medium or dark brown to reddish brown which may result in color variation within the same door. 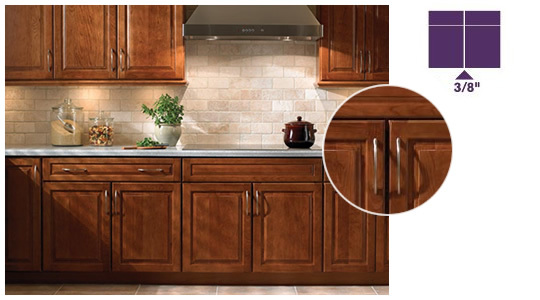 This range in color makes a distinctive statement in your Birch cabinetry selection. Rustic Alder includes some combination of open and closed knots, worm holes, mineral streaks, and sound cracks, reflecting the inherent beauty of the wood. These characteristics occur naturally in the material; no one characteristic is a defining trait of Rustic Alder. Cherry is a rich, multi-colored hardwood, often used in fine furniture. In its raw state, cherry has pinkish-brown hues with occasional shades of white, green, pink or grey. Small gum pockets, streaks, pin knots and figures are common wood characteristics. Natural or light stains accent the color variations in cherry, while very dark stains soften its complexity. All cherry wood naturally darkens or "mellows" with age. Cherry is a rich, multi-colored hardwood, often used in fine furniture. In its raw state, cherry has pinkish-brown hues with occasional shades of white, green, pink or grey. Small gum pockets, streaks, pin knots and figures are common wood characteristics. Natural or light stains accent the color variations in cherry, while very dark stains soften its complexity. All cherry wood naturally darkens or "mellows" with age. Quartersawn refers to the method of cutting the Cherry. Boards are cut through the radius of the rings allowing wavy grain and flaked patterns to show on the face. Rustic Cherry is a rich, multi-colored hardwood, often used in fine furniture. In its raw state, cherry has pinkish-brown hues with occasional shades of white, green, pink or grey. Small gum pockets, streaks, pin knots and figures are common wood characteristics. Natural or light stains accent the color variations in cherry, while very dark stains soften its complexity. All cherry wood naturally darkens or "mellows" with age. Rustic cherry may include some combination of open knots, wormholes and mineral streaks reflecting the inherent beauty of the natural characteristics of wood. Hickory is a strong, open-grained wood that is known for its flowing grain pattern and dramatic variation in color. Hickory often contains random pecks, burls and mineral streaks. A single hickory door might vary from light to deep brown when finished in light or natural stains. Darker stains will mildly tone these color variations, but these very characteristics make each hickory kitchen or bath unique. Rustic Hickory is a strong, open-grained wood that is known for its flowing grain pattern and dramatic variation in color. Hickory often contains random pecks, burls and mineral streaks. A single hickory door might vary from light to deep brown when finished in light or natural stains. Darker stains will mildly tone these color variations, but these very characteristics make each hickory kitchen or bath unique. Rustic hickory may include some combination of open knots, wormholes and mineral streaks reflecting the inherent beauty of the natural characteristics of wood. Maple is a strong wood that is primarily off-white in its raw state. However, maple sometimes contains light hues of yellow-brown and pink as well as light tan or reddish-tinged streaks that darken with stain. Typically straight-grained, maple can be wavy or even curly. Hard maple offers more uniformity than other wood types, making it ideal for living spaces that feature a clean, streamlined appearance. Maple is a strong wood that is primarily off-white in its raw state. However, maple sometimes contains light hues of yellow-brown and pink as well as light tan or reddish-tinged streaks that darken with stain. Typically straight-grained, maple can be wavy or even curly. Hard maple offers more uniformity than other wood types, making it ideal for living spaces that feature a clean, streamlined appearance. Quartersawn refers to the method of cutting the Maple. Boards are cut through the radius of the rings allowing wavy grain and flaked patterns to show on the face. Oak has a prominent, open grain ranging in color from white, to yellow, to reddish brown. Sometimes streaked with green, yellow or black mineral deposits, red oak's strong grain often varies from closely knit to a distinctive, sweeping arch pattern. 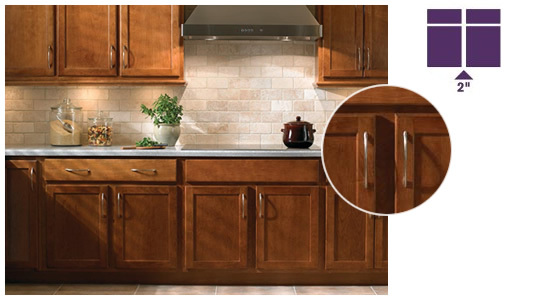 Available in White or Cream, thermofoil cabinet doors feature a flawless, silky-smooth surface. Thermofoil material is applied to medium-density fibreboard (MDF) using an intense heat and pressure-bonding process to ensure durability. Made of laminate, thermofoil finish provides a uniform look from door to door and is easy to clean. By super-compressing wood fibers mechanically, EverCore™ doors and drawer fronts are extra solid, and they don't expand and contract with the weather as much as natural wood can. EverCore™ also costs less than most other wood doors and drawer fronts. Exclusive to KraftMaid. There's no wood grain on an EverCore™ surface, so paint applies evenly without variation. And it minimizes the cracks, crevices, mineral streaks, and wood color variations you can see on natural wood. *Images shown are representative and not necessarily an accurate depiction of the door style, wood species and finish color selected. For the most accurate representation of a finish technique, please order a Finish Chip or Door Sample, or visit your KraftMaid kitchen designer.